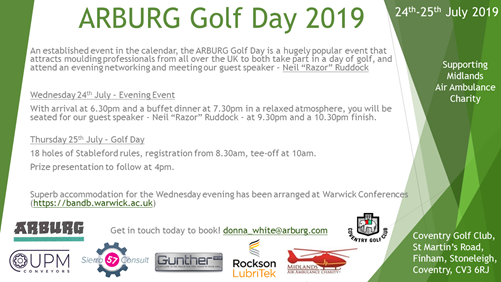 Every year, the Arburg Golf Event is a highlight of the calendar for the Plastics Industry and this year looks to be no different with an excellent collection of companies coming together to attend an evening of entertainment followed by a day of golf. We will be proudly there as one of the event partners, joining Arburg, UPM Conveyors, Gunther UK and Rockson LubriTek at an event that has fast become a staple of our yearly calendar. Held at Coventry Golf Club on the evening of Wednesday 24th July, we will be joined by footballing legend Neil "Razor" Ruddock as our guest speaker, famed for his superb hosting, a colourful character with a range of comedic stories to tell, it promises to be a night to remember! And as part of our long-standing support for Midlands Air Ambulance, the evening will also help raise money for this worthy cause. We look forward to seeing key clients and contacts at the event, and for those that have not already confirmed their attendance then get in touch with us today to book in before the spaces go!